The Eighth Annual Medicine of Cycling Conference will be held at USA Cycling in Colorado Springs, CO August 18-20, 2017. The conference is presented by the University of California, San Francisco School of Medicine and Medicine of Cycling in collaboration with USA Cycling. There are 3 option under the Registration Type. The first is for physicians registering for the main conference the second for everyone else registering for the main conference. The third option is for those who want to do the 3 day hands on fit course and conclude with a single day of the main conference. 2015 Medicine of Cycling CME Conference Faculty are listed on the Faculty page. 2014 Medicine of Cycling CME Conference Faculty are listed on the Faculty page. Dr. Albers is a cardiologist with OhioHealth in Columbus, Ohio. She is a cardiovascular imaging specialist with focus on echocardiography, cardiac stress testing, and vascular studies. She maintains an active consultative cardiovascular practice; her clinical interests include cardiovascular disease management for women, cardiac issues for athletes, and heart disease in diabetes. Steven Broglio, PhD, ATC is an Assistant Professor in the School of Kinesiology and NeuroSport Researcher at the University of Michigan. As Director of the Neurotrauma Research Laboratory, he has evaluated numerous clinical tests used in concussion assessment, injury biomechanics, and the acute and persistent effects of injury. Dr Broglio is currently chairing the upcoming Position Statement on concussion management from the National Athletic Trainers' Association. Curtis Cramblett has been a practicing physical therapist for over 20 years, cycling sports medicine 15 years and cycling and racing in the amateur ranks his whole life. 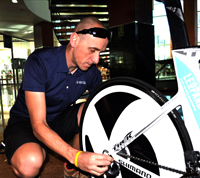 He has worked with teams including Garmin Cervelo and Tibco and many Olympic and world class athletes as their PT, professional bike fitter and coach. He is located in San Jose California and is passionate about cycling efficiency and health. John qualified as a physiotherapist in 1991. He worked with elite athletes and the English Institute of Sport from 1998 though to 2012 supporting badminton at the Athens Olympics and British Triathlon in Beijing 2008. John has been involved with Retul since 2009 and now works full time as a fitter and instructor based in the UK and has worked with Team Sky, Radioshack, Team Colombia and British Triathlon as a fitter and physiotherapist. Happy Freedman is a bike fitter and cycling coach with over 30 years experience, including the Columbia University D1 Cycling Team. For over 10 years, Mr. Freedman has been on staff at Hospital for Special Surgery in New York City, currently in the Department of Rehabilitation’s Prosthetics and Orthotics Lab, where he works in close cooperation with physical therapists and investigators in the motion lab. This is his fifth year of teaching at MOCC. Dr. Goldberg is an Emergency Medicine Physician in Milwaukee WI. He is the director for Emergency Medicine resident education at St Lukes Medical Center. He is the team physician for IS Corp Cycling as well the My Wife Inc Cyclocross Team. His interests include management of acute injuries as well as cyclocross injuries. Wade Hall, Co-Chair of Medicine of Cycling Bike Fit Task Force, Specialized master teacher, is a 34 year Cycling industry veteran. He currently owns Spokesman Bicycles, a Pro-bike shop in Santa Cruz CA, and helps in the teaching lab at Andy Pruitt’s Body Geometry Fitting School in Morgan Hill CA. In the fitting room at Spokesman Bicycles he uses: Retul, Guru DFU, Dartfish, Specialized video capture and closely follows the Body Geometry fitting protocols. Claudette Lajam M.D. is an Assistant Professor of Orthopedic Surgery at NYU Langone Medical Center in New York City and a volunteer physician for the Century Road Club Association and other New York City bicycling groups. Dr. Lajam was part of the CURE Medical Relief team for the Haitian earthquake in 2010. This past March, she organized the NYU Maximizing Cycling Performance Symposium to help boost health education of NY cyclists. "Dr. Aaron Liddell is a member of numerous facial trauma panels covering trauma centers across the Front Range of the Rockies in Denver, Colorado. He has a particular interest in jaw fracture patterns as they pertain to cycling. He grew up a competitive mountain bike racer, and in 1994 competed for the United States in the UCI World Mountain Bike Championships. He took a 15 year hiatus from the bike and attended both dental and medical school, and completed a residency with heavy emphasis in facial trauma and reconstruction." "Dr. McCann is Senior Sports Psychologist with the US Olympic Committee in Colorado Springs, CO. He has been with the USOC for over 20 years including 12 years as the head of the department. He has traveled with nine US Olympic Teams as a sports psychologist, working with athletes, teams and coaches in almost every Olympic sport." "Monique Ryan, MS, RDN, CSSD, LDN, is the owner of Personal Nutrition Designs, LLC based in the Chicago area. She has over 25 years of sports nutrition experience working with competitive endurance athletes. She has consulted with several cycling teams including Team Type 1, the Saturn Cycling Team and the Volvo-Cannondale Mountain Bike Team. Monique was a member of the Performance Enhancement Teams for USA Triathlon and USA Cycling (Women's Road Team) leading up to the 2004 Athens Olympic Games. Monique is the author of "Sports Nutrition for Endurance Athletes,3rd edition"
"San Millán is the Performance Lab Director at the University of Colorado Hospital. He has extensive experience training world-class athletes in a variety of sports, including rowing, track and field, basketball, and, most notably, cycling – he worked with a Tour de France winner and with 15 Grand Tour Podium riders." "Ben Serotta is one of the most iconic figures in the cycling industry, having founded Serotta Bicycles decades ago and is a pioneer the art and science of bicycle fitting." "John Tannyhill, MD, DDS is a Maxillofacial Surgeon in Centennial, CO. He is a graduate of Harvard Medical School and completed his surgical residency at the Massachusetts General Hospital. He has worked as a Team Surgeon for the NBA Denver Nuggets and NHL Colorado Avalanche for several years. Dr. Tannyhill has a particular interest in sports medicine and the management of traumatic facial injuries in the competitive athlete." "Following up on exceptional presentations at the 2010, 2011 and 2012 MoC conferences, representatives, researchers and scientists from the US Anti-Doping Agency will present on the latest in the fight for fair competition." "James F. Watkins is a trauma surgeon at Brigham & Women's Hospital and Harvard Medical School. He is a co-founder of the Medicine of Cycling and co-chair of the Medical Emergencies in Cycling Course (MECC)." "Jeffrey Kutcher M.D. is an Associate Professor in the Department of Neurology at The University of Michigan. He is the Director of Michigan NeuroSport, one of the few sports neurology programs in the country. Dr. Kutcher was recently named the Director of the new concussion management policy in the NBA, is the team neurologist for University of Michigan athletics, a consultant to the NHLPA, and leads the Sports Neurology section of the AAN." "Dr. Bauer is a Professor in Residence at the University of California - San Francisco and is the Director of UCSF's Division of General Internal Medicine Research Program. He has a particular interest in osteoporosis in cyclists." "Jason Brayley M.D. is a Sports Medicine physician at MultiCare Orthopedics & Sports Medicine in Washington state and team physician for Kenda Pro Cycling presented by GearGrinder. Dr. Brayley has a special interest in concussion evaluation and post-concussion care." "Dr. Carroll is Professor and Chair of the Department of Urology at The University of California - San Francisco and the Ken and Donna Derr-Chevron Distinguished Professor. He has authored or coauthored over 325 publications and is principal or co-investigator of several research grants, including the UCSF Prostate Cancer SPORE funded by the National Institutes of Health." "Dr. Gerber is a doctor of psychology at Craig Hospital in Denver, Colorado, specializing in rehabilitation of patients with spinal cord and brain injuries." "Sonny Gill M.D. is an Adjunct Assistant Professor in the Department of Bioengineering at Clemson University and an orthopaedic spine surgeon with a special interest in cyclists with spine injuries. He has also worked extensively with US Ski & Snowboard as a team physician. Dr. Gill will be discussing causes of back and neck pain in professional and recreational cyclists." "Dr. Giudici is a member of the Genesis Heart Institute and specializes in Electrophysiology. He is involved in the research and development of numerous devices and techniques in the electrophysiology field. He has published over 150 scientific papers and is been named as a Best Doctor in America. In 2007, he was one of 50 physicians in North America to be awarded fellowship by the Heart Rhythm Society." "Mr. Hess is a sports and Olympic law expert with Sherman & Howard, LLC. He has represented dozens of Olympic athletes and hopefuls in disputes involving participation in Olympics and other actions involving National Governing Bodies of many sports. Mr. Hess also serves as the Chair of the Court of Arbitration for the International Bobsled and Skeleton Federation." "Mr. Johnson is the Chief Executive Officer of USA Cycling. He holds a Ph.D. in Exercise Physiology, served as a professor at the University of Utah's Exercise and Sports Science Department and is a former director of the school’s Human Performance Research Lab. A former competitve cyclist himself, Mr. Johnson has won eight national championship titles." "Mr. Nydam is with team BMC and has impressive palmares including the Mountains Classification in the Tour of California and numerous other race victories." "Dr. Ross is a sports medicine physician who has been the team physician for numerous professional cycling teams as well as the race doctor for the Philly Week series of races. He is currently runs the Performance Lab, a sports medicine and exercise testing facility in Philadelphia."